The memorable layer cakes I have enjoyed throughout the ages can be counted on one hand. The most noteworthy being the one served at my fifth birthday party. Layer cakes evoke nostalgia like very few other things in life and are on par with love notes from your 9th grade boyfriend or those tiny (AND ADORABLE!!!!) baby shoes that mothers tend to save because they just can’t let go of tiny and adorable things. This birthday cake was no exception. It was an exact replica of Ariel from The Little Mermaid but crafted entirely out of overly-sweetened cake and brightly-colored neon frosting. The adults in attendance probably hated it but me and my pint-sized party-going friends were thrilled! It is mildly embarrassing to admit my childhood love of The Little Mermaid and I would like to come clean with the fact that there were one too many years of enthusiasm for this video. I didn’t care about much back then but I definitely wanted to live in a secret magical waterland and have my best friend-slash-life advisor be a reggae-loving crustacean. Obviously I could have gone without the terrifyingly mean seawitch but hey, the good comes with the bad. I am pretty sure that two large factors contributed to this obsession: one was that I was enrolled in swimming lessons and two was that these were the years that my uncle was in a steel drum band so anytime I accompanied my parents to a gig it was like experiencing a real-life under the sea concert with Sebastian. Because I’m not yet on the kid birthday party circuit, celebratory get-togethers and gatherings of my peers are mostly devoid of layer cakes having been almost replaced by their second cousin once removed, the cupcake. This inspired me to create a layer cake with a grown-up palate which means I felt it obligatory to include two of my favorite ingredients - brown butter and bourbon. I have said it once and I will say it again, brown butter is your best friend in the kitchen. It is such a simple technique and provides depth and flavor to everything. It is butter but better. It is like the updated version of butter. It is Butter 2.0. Making a layer cake should not be a cause for panic – it is just cake after all! – but just in case, I put together a little tutorial on how to frost a layer cake. So whip up a pan of brown butter, take a sip of bourbon to quell your fears, rummage around in your odds-n-ends drawer for your offset spatula and get down to business. It is layer cake makin’ time. P.S. I think of this cake as a sort of “everyday layer cake” (if there is such a thing [there is in my world at least!]) but if an 8″- or 9″-inch cake is too large and intimidating then this would be a fabulous recipe to cut in half and test out your set of 6″-inch cake pans. You got some as a holiday present, right? P.P.S. Do you follow BMUB on Facebook or Twitter? There just may be a Valentine’s Day-themed giveaway coming up and you will be the first to know when to enter to win some “sweet” prezzies! Yay for heart-shaped everything! Preheat oven to 350. Generously butter and flour two 8-inch cake pans. Set aside. In a medium saucepan set over medium heat, melt one stick (1/2 cup or 113 grams) of butter, stirring constantly until it begins to foam. Continue to cook and stir until the foam subsides and milk solids begin to form on the bottom of the pan. Keep a close eye on the pan and turn down the heat if things start to get too toasty. When the butter has deepened in color and smells wonderfully nutty, turn off the heat and pour the butter into a small freezer-safe bowl. You should have about 1/3 cup or 90 grams of brown butter. Freeze for about 15 minutes or until the edges of the butter start to solidify. I set a timer so I wouldn’t forget about it hanging out in the freezer! 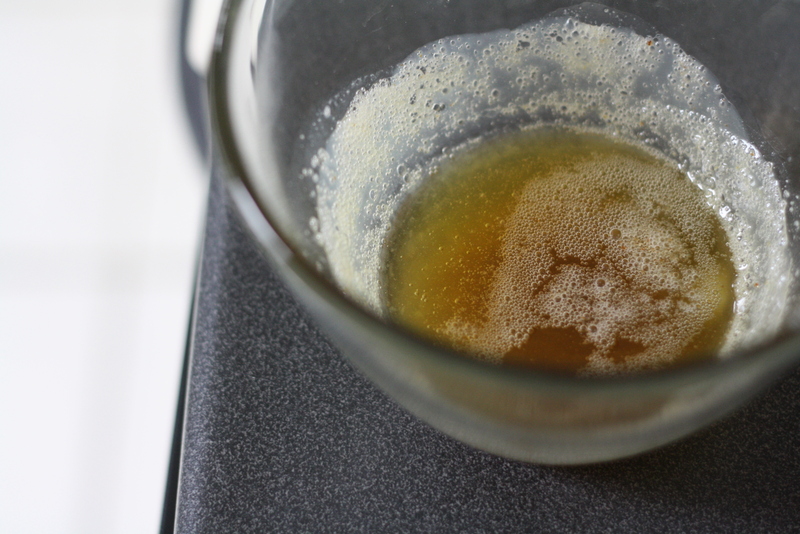 Also just in case – a visual tutorial on how to brown butter. 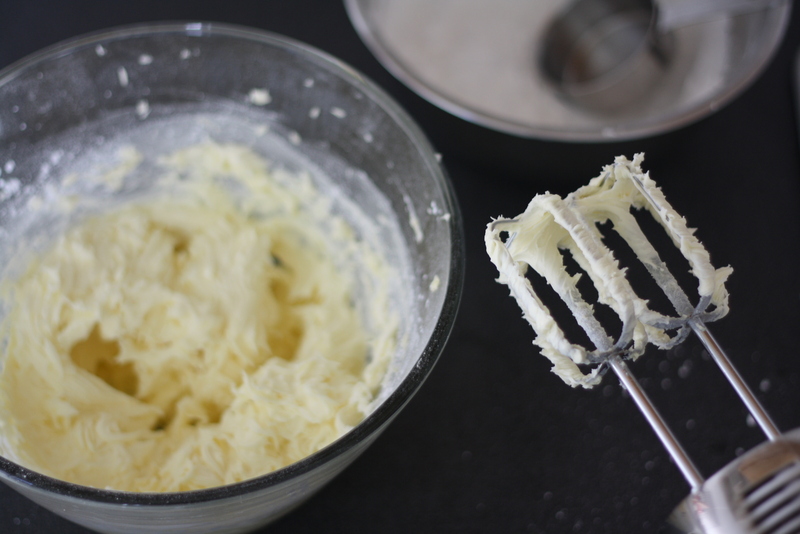 While the butter is chilling, whisk together flour, baking powder, baking soda and salt in a medium bowl. In a liquid measuring cup stir together milk, vanilla extract and the vanilla seeds. Set both aside. 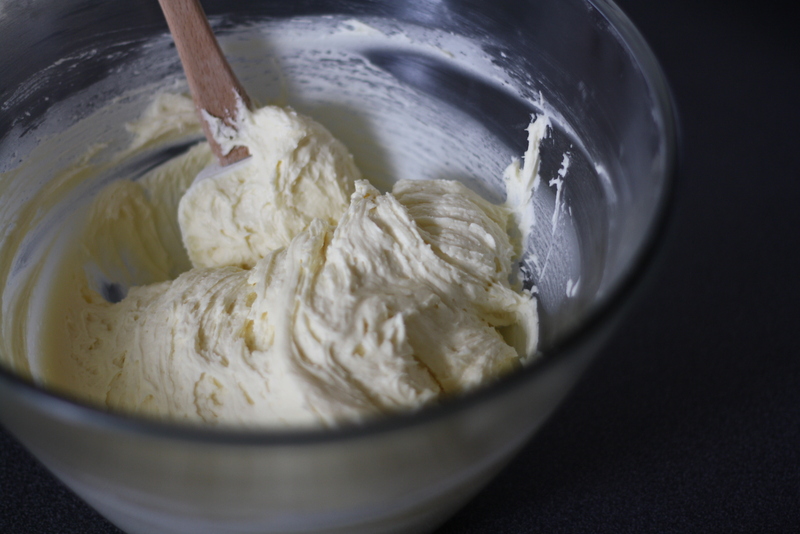 Beat the remaining stick of butter in a large bowl until light and fluffy. Add the chilled brown butter, being sure to scrape the bowl so all the toasty bits of flavor that tend to settle to the bottom are included, and beat until incorporated. Add sugar and beat until combined. Add the eggs, one at a time, beating well after each addition. 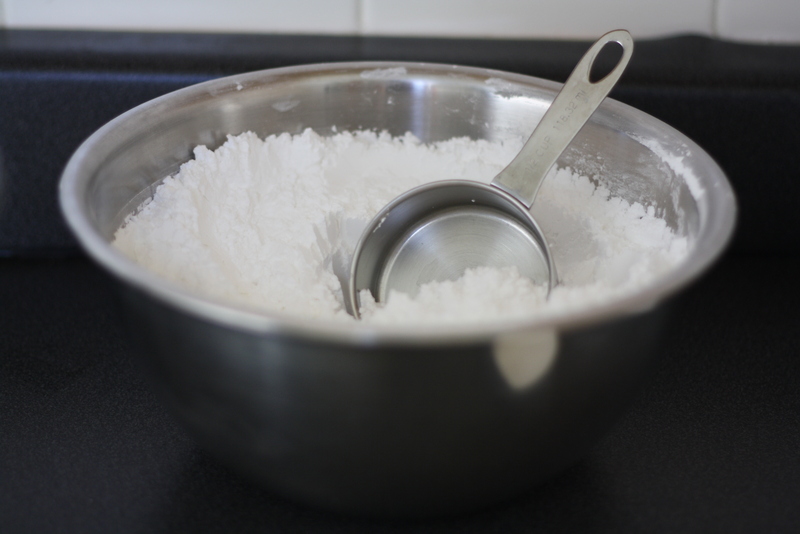 Add the dry ingredients and the vanilla/milk mixture in three alternating additions, scraping down the sides and the bottom of the bowl as necessary. 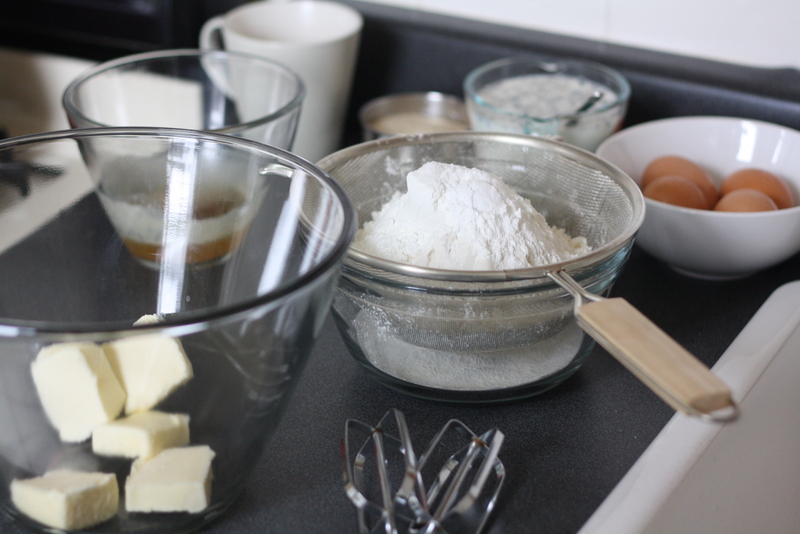 Divide the batter evenly between the two prepared pans and carefully but firmly tap each pan on your counter top. This makes sure that there are as few air bubbles as possible as the cake bakes. Bake for 35-40 minutes or until a tester comes out clean. 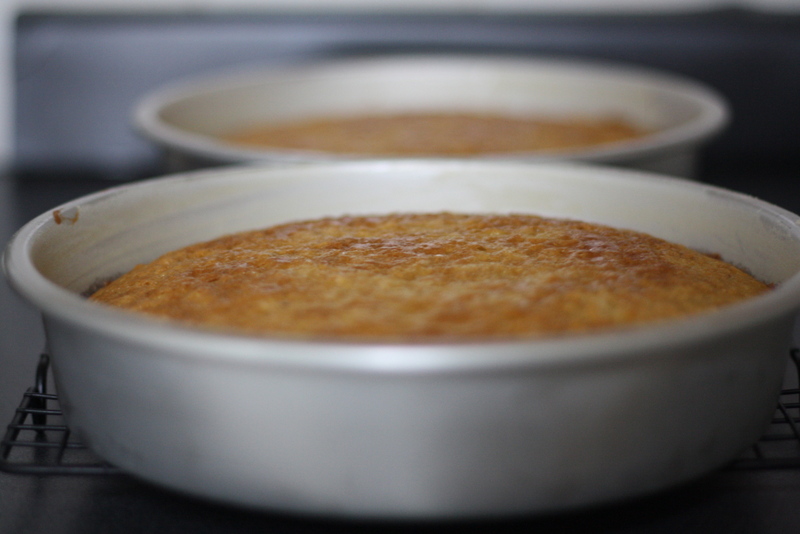 Let the cakes cool in the pans for about 10 minutes, then turn them out onto a wire rack to cool completely. When your cake is fully cooled, frost with one batch of bourbon buttercream (recipe below). 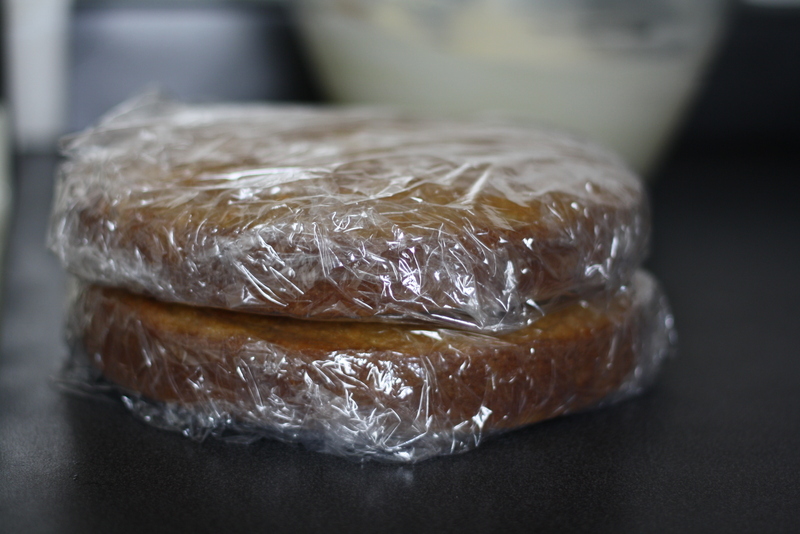 Alternatively, you can tightly wrap the cakes in several layers of plastic and refrigerate overnight or you can freeze them for even longer (as in several weeks or even months). If you go the frozen-cake route, just be sure to let the wrapped layers defrost in the fridge the night before you want to frost your cake. Also, if your cake layers are a bit on the dry side due to their time in the fridge or freezer, an easy way to get them back to being jazzy is to lightly brush them with a mixture that is equal parts water and bourbon (or other booze of your choice). You don’t want to soak the layers but the liquid will freshen them up and help to make sure that your cake is extra delicious. Wondering what to do next? Need a crash course in cake-decorating? 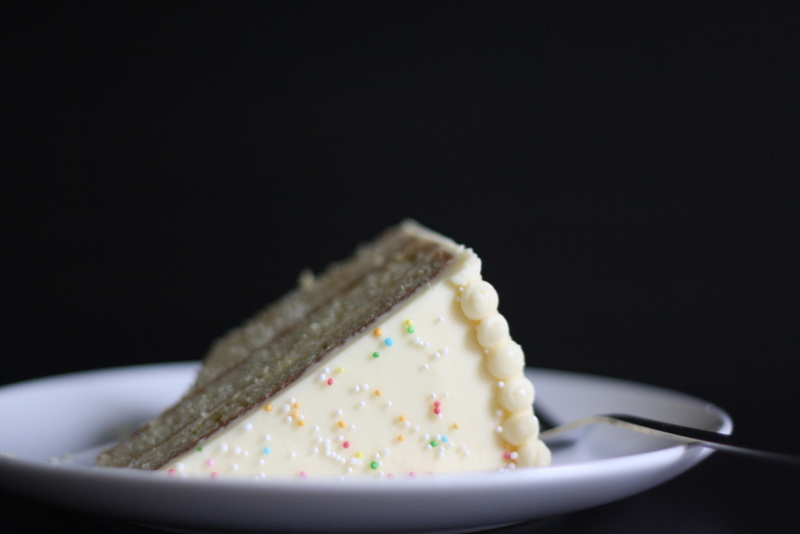 Check out this related post on how to frost a layer cake! *Don’t have cake flour on hand? Make your own by sifting together 3 cups + 1 tablespoon (385 grams) all-purpose flour and 1/4 cup + 3 tablespoons (58 grams) cornstarch and voilà you have 3 1/2 cups of homemade cake flour! Sift the powdered sugar into a large bowl. I usually do this over the sink because A. I have a tiny counter top and B. I tend to get powdered sugar everywhere so this makes clean up just a little bit easier. Beat butter in a large bowl (and I mean large! Five cups of frosting ends up being a lot in the end so use your biggest bowl!) until light and creamy, or about two minutes. Add the sifted powdered sugar 1/2 cup at a time, beating well after each addition. Add the bourbon, vanilla and salt and beat until smooth and spreadable, or about one minute more. Yum! This looks good! Is there something I could use instead of bourbon in the frosting (so I could serve it at a family gathering) but would still make the cake unique? Thanks Susan, that is a good idea. I also had the idea of coffee, but i don’t know how that would work . . . I think coffee or espresso would work well in a butter cream. I’ve made refrigerator cream pies using espresso and they are really good. You could also try some of the flavored coffee creamers. If you really don’t want to use actual bourbon, there is a bourbon extract that will impart close to the same flavor. Hazelnut flavoring would go very well with this. I doubt a Tablespoon of Bourbon is going to be noticeable to anyone BUT, you can usually find bourbon vanilla extract in the baking aisle that would do the trick nicely. Love these ideas! I think a teaspoon of espresso powder would be great. Also a 1/2 teaspoon of almond extract or a teaspoon of ground cinnamon would all work well. Happy baking! I used to stand in front of the mirror trying to get my bangs to be as big as Ariel’s, so I totally feel you. I would have DIED for a Little Mermaid layer cake. This cake sounds (and looks) amazing – yum! You rock! Nice recipe and great blog about Ariel. Big bangs have to come back someday! Brown Butter anything is always a good idea. It has a perfect toastiness that brings depth and a little warmth to anything it touches. Some malt might be a great addition? With the same toasty qualities? I knew there was Bourbon in there…I guess I’ll have to mix up a Boiled Apple Cider Syrup Cocktail and knock one of these out. You cannot go wrong with brown butter. I can’t wait to try this! You had me at bourbon. Or was it brown butter? I’m not really sure which one got me first, but YUM! This is absolutely on my to-make list. I know this was discussed above, but I’m thinking about making this cake and frosting for a 3 yo bday party and I’m a little nervous: all vanilla (just exclude the bourbon)? Yikes – should have thought about this earlier than the ght before! Thanks! Hi! I think all vanilla, or vanilla + almond extract, or vanilla and orange zest would all be fabulous! Would love to hear how it turns out! Happy baking! Oh MY! I just made this today for my birthday (it takes a pretty special recipe to make me want to bake my own damn birthday cake!) and it was loved and devoured by all. I used a big flaked salt which worked great with the flavors – little salt bursts with the bourbon and butter flavors was amazing. I’m even going to make it again next week as the ‘adults only’ cake for my daughter’s first birthday! Then she’ll get the brown butter cake with a different frosting (I was thinking fresh strawberry??) for her own little cake to smash. I wouldn’t mind actually amping up the yummy nutty brown butter taste – what if I browned ALL the butter in the cake recipe, not just half, do you think that would work? I came across another brown butter cake recipe that used all browned butter, so I might just give it a try unless anyone has a good reason not to! Thanks so much for this fantastic cake recipe. Bourbon frosting makes me so happy, too. Browned all the butter and it was goooooooood to the last drop! For those of you wanting a slightly nuttier brown butter flavor, I say go for it! Hi there- my first time on this blog and I made this amazing cake- yum! I actually had two boxes of madagascar vanilla bean cake mix from Trader Joe’s in my pantry already, so I ended up just doctoring up that mix by browning all the butter it called for. Then I completely followed your recipe for the frosting, and I ended up brushing the bourbon/ water mix over the cake as per your suggestion because I made the cake part the day before. I added bourbon and sugar soaked strawberries in the middle and on top. It was seriously a mouth watering amazing cake- it was a HUGE hit. I will definitely be making it again- thank you!! I’ve made this cake twice and both times it was FREAKING DELICIOUS! I did a black pepper buttercream bourbon icing the first time and a strawberry buttercream icing the second time, which might be my favorite cake ever! Thank you for this amaze-balls recipe! OMG – those are some amazing frosting combos! So happy to hear the cake was a baking success! Brown Butter Layer Cake with Bourbon Buttercream | Add more Butter!